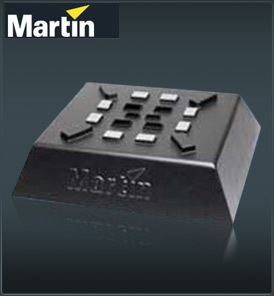 The new Martin RainMAC from Martin is a simple and effective way to keep the rain off your MAC fixture. Made from molded compound plastic with specially designed slots to fit the bracket placing of the entire MAC range, the Martin RainMAC offers resistance to moderately bad weather. Ideal for outdoor events, the UV resistant Martin RainMAC covers the base of your MAC fixture in order to assure the show goes ahead despite what the weather has install. Extremely easy to fit, the Martin RainMAC sports 12 slots for all Omega Bracket positions and attachment points for the safety wire. Plastic covers close the unused slots, deflecting a degree of moisture or rain. The Martin RainMAC stacks easily for transport and is flexible yet robust.